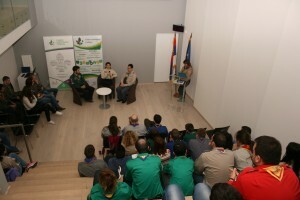 On the 20th of Febr uary, the Scout Association of Serbia has organised the conference “New perspectives and views of the Scout Movement” in the EU Info Centre in Belgrade. This conference was the final activity of the project “Training system for adult leaders tailored for young people”, a project with a goal of education of new Scout leaders for more quality in the youth programme implementation in local Scout units. The Conference was open by the representative of the EU Info Centre Aleksandar Jovanovic and by the chairperson of the European Scout Committee Dr. Andrea Demarmels. document “National framework curriculum for training of Scout leaders”. As a part of the Conference, a short panel discussion was held. Speakers on the panel discussion were: Tanja Jankovic, Chief Scout of the Scout Association of Serbia, Djordje Milic, the project coordinator and Djordje Bogdanovic, a Scout leader and a trainee in the framework of the project. Djordje Bogdanovic explained his experience from the training and expressed how the training has influenced him and his future work as a leader in his local unit, while Tanja Jankovic was talking about the importance of the project for the Association. Djordje Milic presented further plans of the Association related to the training of Adult leaders. As it was shown, one of benefits of the project, besides the training of new adult leaders, was the opportunity for networking of leaders from different local communities in Serbia and the motivation for further cooperation. 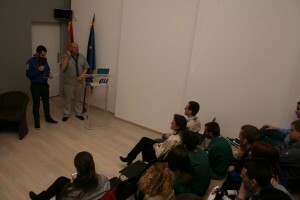 During the project a new model of training in the Association was developed. This draft document was submitted to round tables through the country and comments received were incorporated in the final version named “National framework curriculum for training of Scout leaders”. This document was used for realisation of the Winter Training for Scout leaders and it should lead to creating new membership and increasing the one of the existing Scout units. As Tanja Jankovic has stated, Scout Association of Serbia is thankful to all young people that contributed to the project, by presenting their needs and helped the Association to progress to the next phase of its development. This project, done with young people, for young people and fully supported by adults, created a safe atmosphere for further development of the Association. This development will be relevant for young people, now and hopefully also in future. The Conference was realised in cooperation with the EU Info Centre in Belgrade and financially supported by the Ministry of Youth and Sport of Republic of Serbia.